This interesting name is of early medieval English origin, and is one of the patronymic forms of the surname "Hewitt", which is derived from the medieval given name "Huet", itself a diminutive form of the male personal name "Hugh". This was introduced into Britain by the Normans after the Conquest of 1066, in the Old French forms of "Hughe" and "Hue", which were adopted from the Old Germanic element "hug", heart, mind, spirit, used as the first elements in various originally Germanic compound names such as "Hubble", heart-brave, and "Hubert", heart famous. Hugh was a popular given name in medieval England, generating a variety of derivative surnames such as Hewitt. 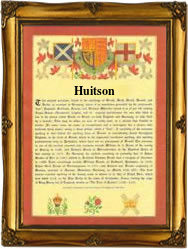 The patronymic forms of Hewitt can be found as Hewitson, Hewetson, Hewison, Huetson, Huison and Huitson. The marriage of Thomas Hewitson and Mary Andrews was recorded at St. James's, Duke's Place, London, on December 8th 1681. The first recorded spelling of the family name is shown to be that of Henry Hwetsone, which was dated 1363, in the Register of the Freemen of the City of York, Yorkshire, during the reign of King Edward 111, known as "The Father of the Navy", 1327 - 1377. Surnames became necessary when governments introduced personal taxation. In England this was known as Poll Tax. Throughout the centuries, surnames in every country have continued to "develop" often leading to astonishing variants of the original spelling.